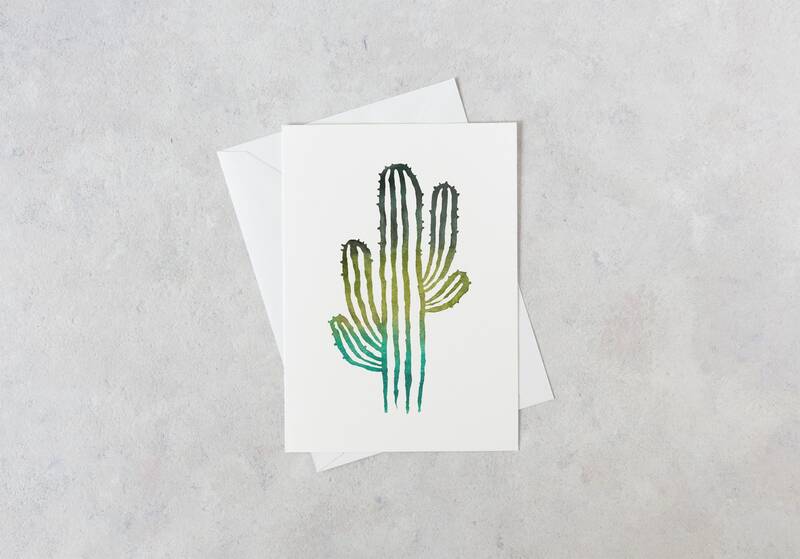 This card features a majestic green-and-blue Saguaro cactus created from an original watercolor painting, then digitized to create this card. The card measures 5" wide by 7" tall, and is blank inside so you can add your desired message. Plus, the 5"x7" format fits a standard frame, so the card can live on as a beautiful work of art in your recipient's home. Each card is printed on thick, white cardstock and comes with one matching white envelope. The card and envelope are packaged in a cellophane sleeve in order to protect it through the mailing process. Plus, shipping is always FREE on greeting card orders! Save $4 when you buy 4 greeting cards—simply enter the promo code PICK4CARDS at checkout when you purchase 4 cards.